We've finished up most of our coverage of the Detroit Auto Show and are still marveling at some of the latest tech and design we've seen. Will we feel that way in 25 years? Photos from the archives suggest we'll mostly just laugh. Unlike me, Bob Lutz is a regular visitor and in 1992, he chose to promote the Jeep Grand Cherokee by driving through the window of the Cobo Center with Mayor Coleman Young in the passenger seat. No bean counters were harmed during his stunt. Now let's see what else made an impression on the crowd during the past. Toyota agreed to debut its Lexus brand in Detroit, just like Nissan did with Infiniti. Still, the Toyota stand needed careful planning too. The Cadillac Voyage was actually a concept from the year before with a clever four-wheel drive system, but GM kept it exciting with a pink skirt. Dodge managed to display a car with ill-fitting doors. The star of the 1990 show was obviously the Geo Metro Cabriolet. Luckily, some made it to Europe over the years. With the CERVIII, GM displayed another Corvette that never was going to happen. The last Cyclone was made in 1971. This concept however had a TV and an electrochromic glass roof that changed tints depending on the lighting. Two cars, two engines, one giant Voyager. Oh yes, the times when you could buy an Alfa Romeo in the US. And just look at that Zagato! More hot Geo action with the Storm! Nuccio Bertone looking classy in front of his Emotion Concept. Pininfarina's answer to the Bertone was the Chronos. 1992, the year of the snake. Mercedes-Benz debuted its new S-Class outside of Europe for the first time. Slot car racing makes everything better. The ladies were much needed, the Allanté wasn't going to do it on its own. Chevy did some acid before the Highlander. Ford however made something I would rock. Hyundai started experimenting. Wasn't there yet. Jeep made a car more economical by adding another 'e' to its name. The Oldsmobile Aerotech (powered by an Aurora V8) was nothing like the production car. Mel Farr could sell a car. And fly. The '94 Viper Venom Concept didn't make much sense, not unlike her outfit. The Chrysler Atlantic. Where's a fire when you need one? Andy Vajna has lost something in Detroit. Removing the roof takes two. Mercury made it snow inside for the Mountaineer. The budget Viper that never was. Experts all over the place. Lincoln proving that the Navigator can penetrate water. Volkswagen's Phaeton was yet to come. The meaningless North American Car Of The Year award went to your dentist's car. 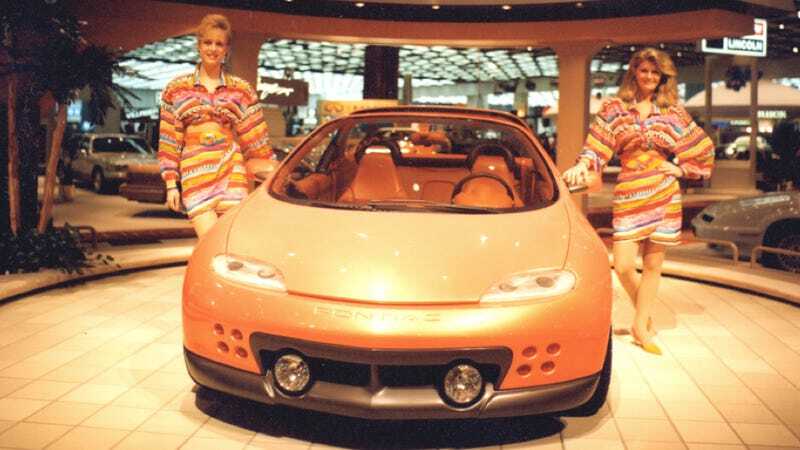 Project Vantage was Ford's most exciting concept by far in 1998. Matt Hardigree attends the Detroit Auto Show for the first time. As always with pickups, Texas moves to Michigan. Mitsubishi did it ten years before The Fast and Furious! Subaru invited a man who needs a hat more than Niki Lauda. President Clinton missing the doors. Gathering ideas for the presidential limousine. "The women I could get with a C5..."